It’s a common question in Siem Reap, home to the many hostels and hotels that feed tourists to the Angkor Wat temple complex. Sunburnt tourists trade stories while cooling off in the bar with a can of cold, cheap Angkor beer–the famous temple on the label collecting beads of condensation. A list generally follows the question. Oh, I’ve seen Bayon, Angkor, Banteay Srey, the waterfall and the Tomb Raider temple. Angelina Jolie as Lara Croft at Ta Prohm. In his 2002 article for the International Journal of Heritage Studies, Tim Winter outlines the history of Angkor, as UNESCO terms it, “a geographical region, an archaeological site and a cultural concept”. Angkor “emerged as a major seat of power early in the 9th century AD and lasted until the capital’s abandonment in the middle decades of the 15th century” wherein god-kings would construct an irrigation network followed by statues of deceased parents and then a mountain temple dedicated to the king himself. This culminated in Angkor Thom, an extravagant city complex built in the 13th century, the demands of which are cited as contributing to the empire’s eventual decline. Angkor was “discovered” by French botanist Henri Mouhot in 1862; the overgrown aesthetics leading him to claim that Angkor was a lost civilization, though the local Khmer (Cambodians) would surely disagree. The French colonial administration constructed Angkor as the apogee of Khmer civilization, the abandoned state of which showed Khmer in decline, their culture lost. It was up to the French, of course, to restore this culture, therefore legitimizing their rule. Even after French rule and the totalitarian regime of Pol Pot, Winter notes that “the deeply symbolic national significance of Angkor within contemporary Cambodia” still remains. 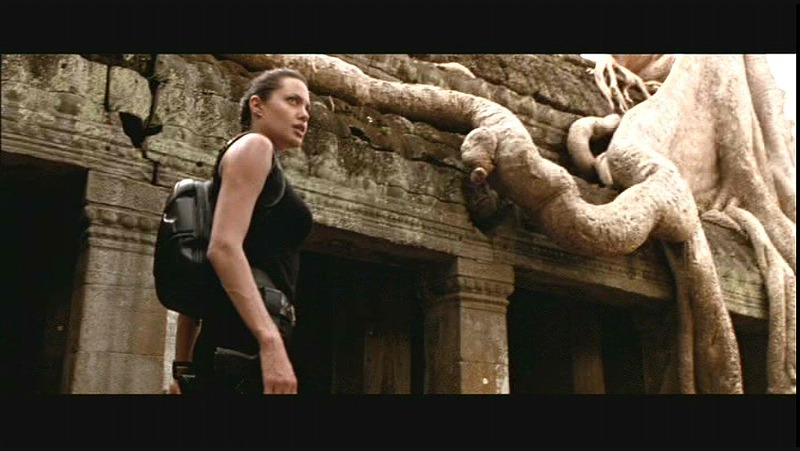 When scenes from the movie Tomb Raider were filmed at Angkor Wat in 2000, tourism was already on the rise. Winter establishes the heritage simulacra used by the film producers, who were mimicking the video game world in the real world, dissolving the boundaries between physical and virtual. Sets were built around Angkor Wat, further Orientalizing the Khmer–Angkor was now in the middle of an exotic, chaotic village on stilts in the water. A woman is cooking in a shack as Lara Croft paddles up the the shore amidst the cacophony of a “fallen” society–echoes of the French colonial interpretation of Angkor remaining intact nearly 150 years later. Ta Prohm, a temple about 3km NE of the main Angkor Wat complex, has been left largely unreconstructed and is being conserved as a partial ruin. This has been intentional, to preserve the photogenic and atmospheric experience so that the tourist may imagine themselves as an early (white, western) explorer, perhaps Mouhot himself. 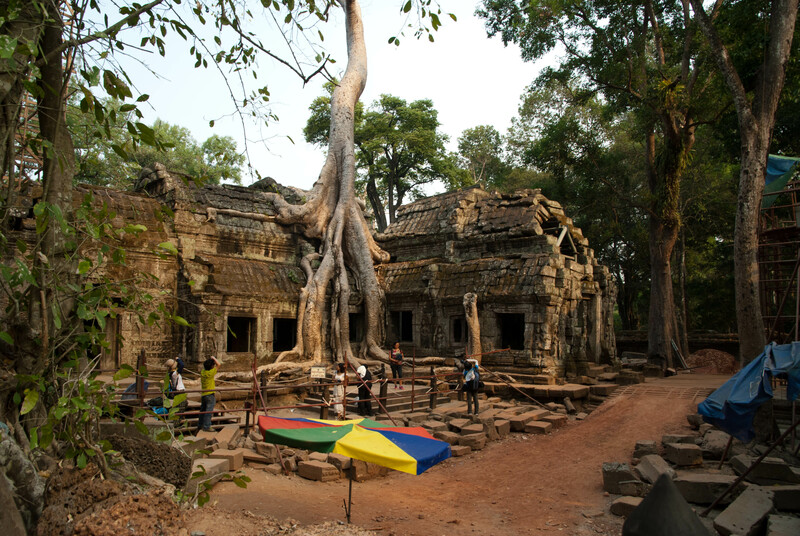 Tim Winter documents “the tourist encounter” at a similar temple, Preah Khan, also being conserved as a partial ruin. 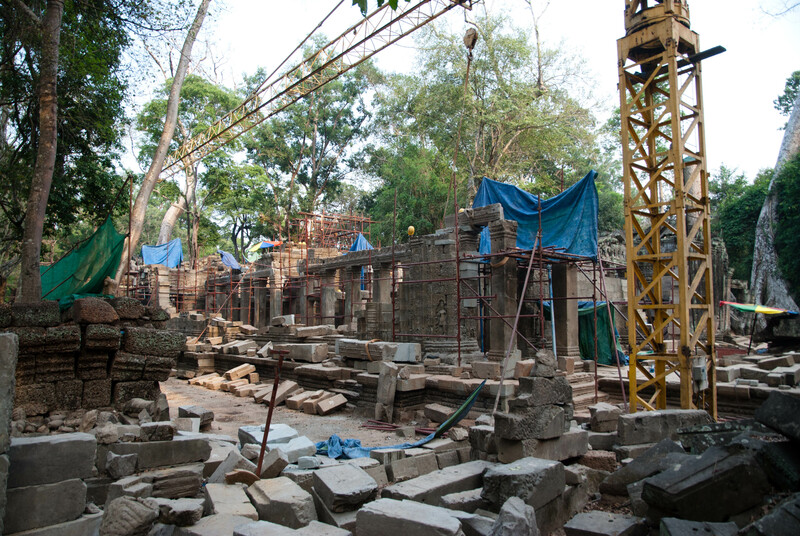 The World Monument Fund director who was responsible for preparing Preah Khan for tourism wanted to create specific routes for tourists so that they may “experience Preah Khan the way it should be experienced” and thus create a “more authentic spatial narrative across the site”. What I found at Ta Prohm was extraordinary beyond my expectations. A large section of the temple was closed, as it was being conserved. It turns out that preservation-as-ruins was not working out so well for the site as the giant Banyan trees were making the temple perhaps a bit too ruinous and atmospheric. It was a large construction site, yet not a single tourist mentioned this in their description of the site. They were still lining up to take their photographs in the same spots that featured in the film. The process was fascinating. The subject of the photograph and the photographer would wait in a crowd, then the subject would run up to the spot and the photographer would carefully frame the photograph so that the subject would look all alone at the abandoned/forbidding ruin, an early discoverer/adventurer. Sometimes the subject would pose as if they were climbing up the ruins. This is not all that uncommon; many photographs of heritage are composed by editing out the hoards of fellow discoverer/adventurers, thereby creating the experience of the site as singular. This was especially fascinating at Ta Prohm, as the tourists self-consciously performed the explorer/discoverer/video game narrative. Remarkably, a girl came up to us and said, “did you notice that the layout of this temple (we were at Angkor Thom) is just like Temple Run?” I did not know what Temple Run was, but Dan did–it’s a popular game for the iPad wherein the adventurer (a female, incidentally) moves through exotic locations looking for treasure. Go figure. How Tomb Raider and other popular depictions have acted on our imagination of cultural heritage and how we in turn reenact these tropes while building our identity through digital media and online presence is pretty fascinating stuff. The question of what have you seen becomes what are you actually seeing and what are you intentionally editing out of your heritage experience?